The Port of Hull has been in existence since the 12th century and is situated on the North bank of the River Humber and the junction with the River Hull. Located south of the Humber, the airport is able to accommodate a huge variety of freight and passenger aircraft around the clock. The Humber is home to a number of ports of all sizes and is the busiest complex of ports in the UK. The ports on the Humber import and export a wide range of goods from cars to wood. The goods that are imported and exported from the Humber go all over the UK and all over the world. About 16,000 people work for the ports in the Humber and many local businesses work and are supported by the ports. Hull – the home of the UK’s only offshore wind turbine blade manufacturing site. 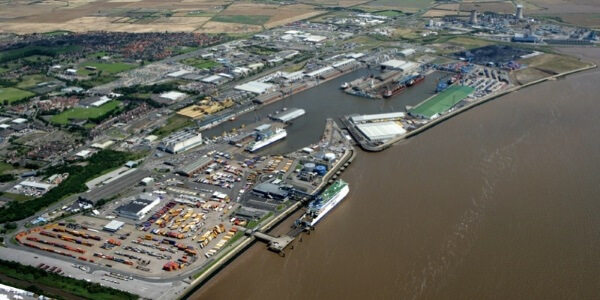 Immingham – currently the UK’s largest port, by volume. Grimsby – the home of the UK’s Operating & Maintenance facilities to run a lot of the turbines in the North Sea. Killingholme – one of the largest ports in the UK for importing and exporting cars. Goole – the most inland sea port in the UK. Hull has a direct ferry service into Zeebrugge and Rotterdam which only takes about 13 hours. These ferries carry both passenger and cargo. The three airports in the region are for both freight and passengers and have a number of routes in the UK, Europe and to other parts of the world. Humberside Airport has become a major part of the offshore industry with workers being transported to oil rigs and other offshore activities from the airport. Navigate to Humberside Airport. Doncaster Sheffield International is one of the newest airports in the UK and is growing in both passenger numbers and the amount of freight passing through the airport. Navigate to Doncaster Sheffield International. Leeds Bradford Airport has the most flights out of the area and has a number of flights outside of the EU. Navigate to Leeds Bradford International. All the three airports have plans to expand and develop what they can offer customers. The region is well linked to the UK’s road network with all areas of the region having a major road nearby. Hull and the north bank of the Humber has the A63 linking to the M62 and the south bank has the M180 and A180 serving the ports in North East Lincolnshire and industry in the area. These roads lead to the M1 and M62 which allow easy access to the south and west of the UK. The area around the major cities of Leeds and Sheffield are well linked to the M1 and A1 which are among the most important motorways in the UK. Navigate to road page. The region has good rail connections with the rest of the UK, both for passengers and freight. All the major cities and towns in the area have multiple daily services to London and other major cities, such as Manchester and Birmingham. The main sea ports in the region all have a connection with the rail network to transport freight throughout the UK, for example, Hull and Immingham transport Biomass (an alternative to coal) to the Drax power station by rail. Navigate to rail page. Over the last few years, the Humber ports have started to work and become an important location in the renewables sector and a good example of this is Siemens Gamesa in Hull who build the wind turbine blades for the wind farms in the North Sea. The Siemens Gamesa site is where they also bring all the components together for the journey out into the North Sea ready for being put up. The North Sea has a number of on-going and planned wind farm projects and Siemens Gamesa is in a fantastic location to make the blades for a number of these projects. The Humber and Yorkshire region has a number of further and higher education options including Universities, Colleges and Apprenticeships. As well as courses aimed at the renewables sector, Universities and colleges in the area have a wide range of courses from Business Management to agriculture. The area has a number of opportunities of apprenticeships and ‘in work’ training like HCF Catch and other training organisations which cover a wide range of skills from Offshore to a Caravan factory. Examples of other training organisations in the Humber are HOTA and HETA who do apprenticeships and short courses aimed at specific skills. Due to the Humber being heavily involved with the logistics industry, a mass of data and information is produced about how the sector is performing and interacting with other industries in the region. To display and explain some of this data The Logistics Institute Data Observatory (LIDO) is being created as a tool to provide data, information and statistics on logistics and trade within the Humber area. LIDO has a range of data including exports and imports to/from non-EU countries from every UK port. LIDO has the facility to help users to build their own graphs on port statistics from how much fruit is imported into the UK at the port of Liverpool to how many vehicles are exported at the port of Grimsby. Navigate to Chart Builder. There is a comparison builder to compare different ports, years and items and to be shown in an easily understandable chart. Both the chart builder and the comparison builder work with data provided by UK Trade Info which are part of the government body involved with trade. Another major section of LIDO is the publications page. The Publications page is a library of reports, articles and other publications about the Humber in regards to logistics, economics, industry to name a few. There is an option to search by your own words or a list of tags has been provided to show publications on a specific topic. The publications list is always being updated and new articles are being added regularly. LIDO is always being updated with the latest data and information available and we welcome any suggestions on what data is needed by our users. The Logistics Institute Data Observatory (LIDO) is being created as a tool to provide data, information and statistics on logistics and trade within the Humber area. A key element of the website is to enable people to get data and graphics on the current position of the Humber. This website will cover all the main Humber logistic assets such as seaports, airports and rail networks, as well as the network of logistic services in the surrounding area. Also the main industries such as the Chemical industry in the region will be promoted. The site was designed to allow individuals and businesses to understand the advantages of using the Humber as a port of call for their logistics and trading needs. The website will do this by outlining the strengths and expertise that the Humber region possesses and how these can aid inward investment in the area. LIDO is the outcome of a collaborative effort between the University of Hull’s Logistics Institute, various regional stakeholders including private organisations and local authorities. LIDO will grow in scope and functionality over time, providing more information about the Humber and tools to analyse the logistics and trading facilities in the region. Established in 2008, the Logistics Institute is now a world-renowned centre for research, education and expertise in logistics and supply chain management. We are a leader in applied logistics research and industry outreach programmes, both national and international. Our focus is to drive sustainable growth through viable logistics. As a world-class institution, the institute tackles industry problems through research, education and training, industry grants and funding, enterprise consultancy and Knowledge Transfer Partnerships. Our research blends the relevant expertise to tackle challenges such as end-end global supply chain optimisation, particularly with an emphasis on green and sustainable supply chain design and management strategies; the design of logistics hubs and corridors; intelligent tracking solutions; digital supply chain and industry 4.0 - planning and execution under massively connected systems. It also includes socioeconomic and environmental assessment of complex systems; and process design and improvement for better services.